Is there integration – structural or functional, with other health-related Commissions, such as HIV Commissions? If so, to what extent? Fully? To a large extent? To some extent? 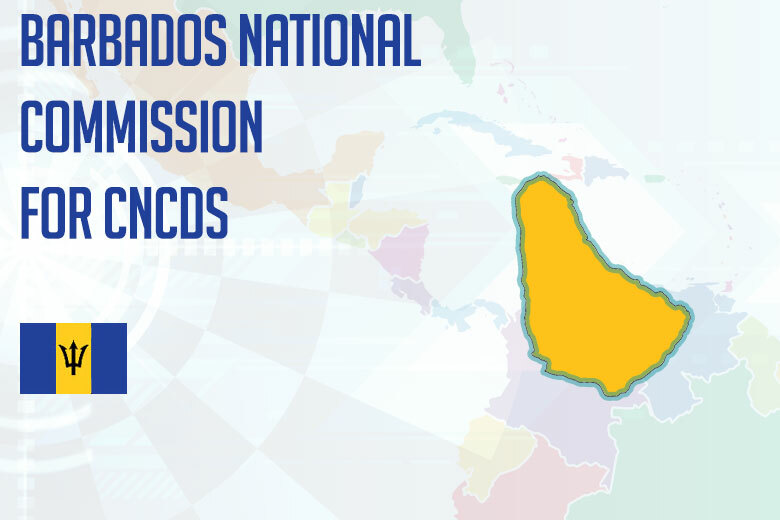 The NNCDC in Barbados is the oldest in the region, having held its first meeting in early 2007, pre-dating the Port of Spain NCD Summit and Declaration. Since its inception, there has been consistency of leadership. Its Chairperson, a well-known and internationally recognised academic and physician, has remained unchanged, despite changes in governing political parties and Ministers of Health. 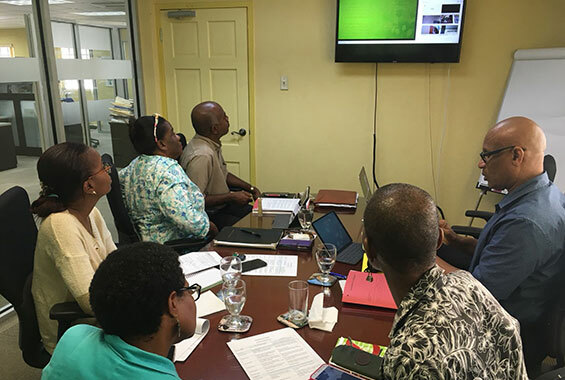 The strategic plan of the NNCDC and the Barbados Strategic Plan for the Prevention and Control of NCDs are one and the same, and was produced in collaboration with the Health Promotion Unit and the Senior Medical Officer (NCDs). The Government of Barbados has shown strong and consistent commitment to NCDs through the funding of national risk factor surveys in 2007 and 2013; the Barbados National Registry (the region’s only active surveillance registry for heart attack, stroke and cancer); and a staff member dedicated to the Commission – the Senior Health Promotion Officer in the MoH is the Secretary of the Commission. The Commission has had many successes, such as influencing product reformulation by a leading local bread manufacturer, with the result that the salt content of the products is lower than international targets, and contributing to enactment of legislation banning smoking in public places and prohibiting the sale of tobacco products to minors. It was also instrumental in securing inclusion of prevention and control of NCDs in Protocol V1 of the Social Partnership, which is a mechanism established at the highest level among government, private sector, and the trade union movement to determine and act on areas of major developmental concern in a collaborative and consensual manner. 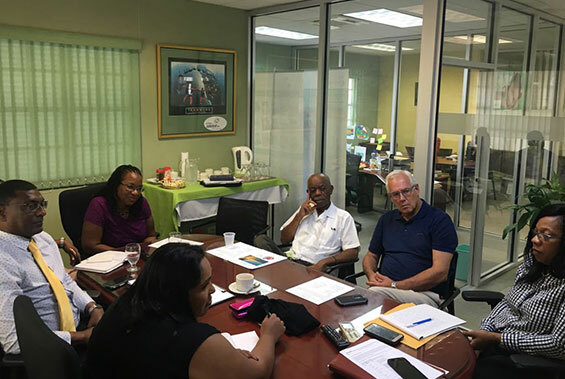 In June 2018, with the support of the Guyana PAHO Country Office, the HCC hosted members of the Guyana National NCD Commission for a 2 day Study Tour aimed at learning more about the experiences of the Barbados National NCD Commission. The Guyana team consisted of: Dr. Shamdeo Persaud (CMO Ministry of Health Guyana), Dr. Kavita Singh (NCD focal point Guyana MOH); Delicia Haynes; and Dr. Karen Roberts (Specialist, Non-Communicable Diseases and Family Health, PAHO). This is part of HCC’s larger effort to support the strengthening of the multisectoral response to NCDs in the region through support to these multisectoral platforms mandated through the 2007 Port of Spain Declaration. Both the St. Lucia and the Grenada NCD Commissions have undertaken similar exchanges to visit the Barbados National NCD Commission which has been chaired by Sir Trevor Hassell since its formation in 2007, and in this time has held 100+ meetings and enjoyed uninterrupted tenure. The HCC and partners have been continuing their work in the region aimed at supporting the multisectoral response through the strengthening National NCD Commissions (NNCDCs) or their equivalents. 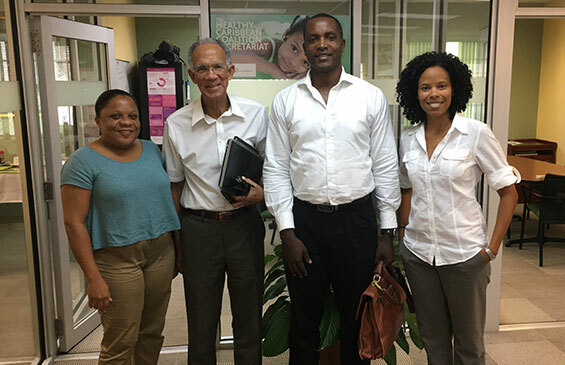 On January 11-12, 2018 Dr. Damian Greaves, Chair Grenada NNCDC and Dr. Sonia Nixon, Senior Medical Officer of Health for NCDs, Grenada and past interim NNCDC chair, visited Barbados for a 2 day site visit/observership with the Barbados National NCD Commission. ‘This session for us over the last 2 days has been totally engaging and eye opening. I am leaving very ‘buoyed up’ and highly motivated.’ Dr. Damian Greaves, Chair of the Grenada NNCDC. ‘I am very grateful to HCC and the Barbados NNCDC. This experience can only enhance the forward movement of the commission.’ Dr. Sonia Nixon, Senior Medical Officer of Health for NCDs. On August 17-18, 2017, Ms. Lydia Atkins, Alternate NCD Focal Point for the St. Lucia Ministry of Health and Wellness and a member of the recently formed St. Lucia NCD Commission, and Dr. Owen Gabriel, Consultant Oncologist, and Chair of the St. Lucia NNCDC, visited Barbados to meet with the Barbados NNCDC. The St. Lucia NNCDC was initially established in 2013 and went into dormancy after serving a two-year term. In 2017 it was re-established with a new Chair and new membership and the mandate to enhance visibility of the National NCD Agenda in an effort to mobilise and strengthen public, private and civil society partnerships for reducing the NCD burden at the national level. The Commission has been given an agenda of accelerated NCD action that will place St. Lucia on a trajectory to bring the country closer to achieving the 2025 global NCD targets and the health related targets within the 2030 Agenda. To achieve these targets there is a need to ensure that the Commission is adequately equipped to advance the work on NCDs.